Lines of mists are undulating lazily in an astral tranquility, like the kittens of dandelions pushed by the weak winds of heat waves. It's with this intro, filled by the soft perfumes of a Mellotron suspended in the spirits of the times that "Into the Infinite" invites us to another festival of Memorandum tribute to Tangerine Dream. A bass line spreads its heavy sequenced chords which mould themselves onto the curves of the lines of mists, pushing the tempo towards a circular movement where the harmonies plunges us in the dark atmospheres of Stratosfear. Heavy and fluid, the rhythm of "Into the Infinite" rushes into the chthonian voices before lowering its intensity under the caresses of a synth to the very detached lines of the style of Steve Grace's influences, but just as much musical. It's a brief moment of calm where the heavy rhythm takes back its rights before sinking for good into the sighs and the singings of astral bodies. Like it or not, Logic Gate comes back haunting the spheres of EM with another work which depicts the worship of his creator for the black EM of the analog years. And as on From the Silence, “Voyages” is to crunch at full ears even if Steve Grace presents it to us with a more original approach. "Voyager" is a jewel of black and sinister ambiences. The boat is on the sea. Charming the seagulls of its copulative undulations with the waves, it's struck by a heavy dark pulsation which jumps on the spot with frenzy. These pulsations awaken these clouds of mist which fill the morphic moods of the works of Logic Gate with winds of violins which hide the discretion of the piano notes from which the simultaneity flees the one of the sequences. And slowly, this rhythm bombarded stubbornly faints in the lunar embers of a long ambiospherical passage where these notes of piano struck in the minimalist art draw the harmonies of a lullaby for cherub's imps who let gladly being caressed by the magnificence of an oboe forged in the patience of synths. This is splendid and intensely sensitive. Except that a heavy drone shakes the calmness a little after the 7th minute. A powerful hoarse breath which brings its triplets, and other more shrill breaths, disrupting so a ritornello of serenity that we would have wanted eternal and which comes back for good from this useless storm, bringing in its trail these sequences that we had lost from ears. These sequences, but also percussions, and their jingles knock out the ending of "Voyager" of a rhythm as heavy as slow which wraps itself of a very beautiful symphonic veil. It's a superb well placed 12 minutes! "Starlight" is a short ambiospherical track where cosmic tones shell their idlenesses in layers of mists and in the bed of a slow melodic approach mislaid from "Voyager". That reminds me a chthonian mixture of Rogue Element and the cosmic moods of Software, in particular at the level of the crystal clear sequences which swirl with so much slowness. It's maybe short but it remains very musical. Trapped in heavy and dense strata of Mellotron and its gaz of fog, the rhythm of "Permafrost" is as much soporific as its horse collar of mist. A beautiful line of a solitary synth sweeps its musing under winds of an ocean of fire, while that notes of an electric piano roam with a full harmony of déjà-vu under the slow pulsations of a bass line which avoids the rhythm in front of so much ice floes of fogs. The black march may change skin at around the 7th minute point, swapping its veils of mist for an intense chthonian choir; "Permafrost" remains as apathetic as black, but always frees this soft perfume of somber night-madness which always soaks the folds under our sheets of terror. It's in these ambiences that "The Voyage Home" is wrapping us in order to immure the musical journey of “Voyages” in a bath of nostalgia. Layers of synth to timeless musicalities blow on the fine sequenced keys which dip the tip of their sounds into a superb line weaved in the black harmonies of an old organ à la Klaus Schulze (Irrlicht) and of its ghostly singings. These sequences follow each other in single file, moulding the whims of a movement which answers of its echo in a dense vampiric musical painting. Another line of sequence, with darker pulsing keys, forges a slow upward minimalist rhythm which strides along the void in this lyrical duel that are doing the lines of mist and the glaucous harmonies of an organ of the darkness. A beautiful fluty line re-appears from the past, caressing a rhythm which was lost in these black breaths for a brief moment before taking back its rights over a more lively circular rhythm but always draped by this intense morphic veil which retains the rhythms of “Voyages” in its beautiful prison of mist. Different from From the Silence, “Voyages” remains nevertheless very beautiful. 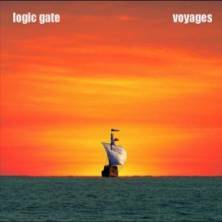 Logic Gate offers a more personal album where the rhythms are more evasive and the ambiences darker. An album which exhales at full winds the reminiscences of his influences but with a bigger freedom which makes that “Voyages” offers more originality in a musical pattern where the summit seems unattainable. The fans of old Berlin School filled by the gasps of organs of the darkness running on heavy dark sequences are going to feast.